it seems the old debate on the virtue of gendering toys has sprung up again. my facebook queue has been overrun with articles,podcasts, videos all decrying the girlie-girl culture we find ourselves a part of. this most recent debate seems to have been sparked by the outrage over a new kind of legos designed and marketed specifically to girls–legos, not in traditional primary colors but in pastels and pink. protesters fought back with a picture from another legos marketing campaign. 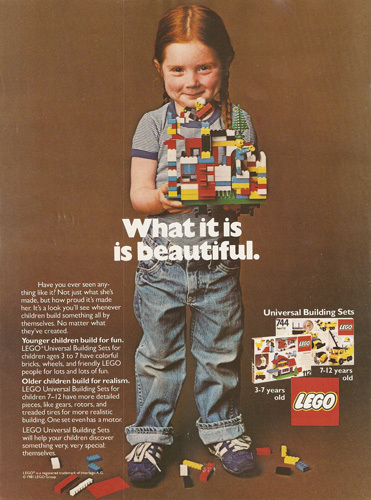 this one has a cute redheaded girl holding a magnificent legos creation with the tag line, “What it is is beautiful.” this picture made me catch my breath, it is so reminiscent of my own delightful copper-haired imp. i look at this picture and think yes, this is what i want for my daughter. But I think mine and so many of my feminist peers reaction to girlie-girl culture at least merits some self-analysis. I am certainly sympathetic to the outrage that I’ve seen expressed on this subject. As a parent, I work incredibly hard not to fall prey to the princess culture being marketed to me and my daughter and I feel angry that one paradigm of girlhood is being sold to her as the only way to be a girl. But I also wonder if the moral indignity that so many of us feel at the princess-ization of little girlhood fails to acknowledge fully the complexity of gender. I believe the new “girl” Legos provide an excellent opportunity to do just this. Let me begin with a personal anecdote. I played with and enjoyed Legos as a little girl. I’m sure that at times I looked quite like the little girl in that picture. But I never felt any sense of ownership over my legos. In fact, if somebody would have asked me at eight, I probably would have said that Legos were a boy toy that girls could play with too. I never felt as if Legos were designed for me and the truth is, they probably weren’t. So much of Western culture is based on the male experience; it has been up to women and girls to shoehorn ourselves into what society considers normative. As an adult I can say of course primary colors and even Legos are gender-neutral. But are they really? As a little girl I understood that bold, saturated colors were masculine and this was well before girl culture was painted pink. I have to wonder that if our insistence that Legos remain as they always have actually perpetuates the male experience as normative and in so doing, subtly discourages girls from pursuing occupations like engineering. Think of what it would mean if girls really felt like it was appropriate and desirable for them to play with toys like Legos. What would happen if young girls felt like Legos were designed for them just as much as they are for boys? If the color pink invites girls to play with Legos, to use their imagination, express their creativity and develop their spatial skills can it really be such a bad thing? In no way am I saying that I approve of where the pendulum has swung. I emphatically do not. But expecting little girls to think that regular Legos were made for them when everything they are presented from the moment they are born says otherwise is asking a whole lot. It is up to us as adult women to get over the baggage that comes with pink and princesses and think critically about what toys and experiences will best shape our daughters into the assertive and empowered women we want them to be. And if you visit our home you are welcome to play with our big bucket of mixed primary colors and pastel Legos.